Brought up in the high society of the French court at Versailles; married at 17 to an aristocrat and soldier, with a promising diplomatic career ahead of him; serving the Queen as a lady-in-waiting; HENRIETTE-LUCY DILLON GOUVERNET DE LA TOUR DU PIN (1770-1853) could not have imagined that she, her husband Frédéric-Séraphin and their two children Humbert and Séraphine, would be fleeing for their lives to America in 1794. Disembarking in Boston after a 60-day journey, the emigrants traveled to Troy, New York, where they boarded with the nearby van Buren family to “learn American ways” before acquiring property of their own. In September, my husband opened negotiations with a farmer whose land lay . . . on the road from Troy to Schenectady. It was on a hill overlooking a wide stretch of country, and we thought it a very pleasant situation. The house was new and pretty, and in good condition. Only a part of the land was in cultivation. There were 150 acres under crops, a similar area of woodland and pasture, a small kitchen garden of a quarter of an acre filled with vegetables, and a fine orchard sewn with red clover and planted with ten-year-old cider apple trees, all in fruit. We were told that the price was twelve thousand francs, which General [Philip] Schuyler thought not excessive. The property was four miles from Albany . . . .
As soon as we had the house to ourselves, we used some of our money to set it in order. It consisted of only a ground floor, raised five feet above the ground. The builders had begun by sinking a wall six feet down, leaving only two feet above ground level. This formed the cellar and the dairy. Above this, the remainder of the house was of wood, . . . The gaps in the wooden frame were filled with sun-dried bricks so that the wall was compact and very warm. We had the inside walls covered with a layer of plaster into which some colour had been mixed, and the whole effect was very pretty. . . .
. . . [O]n the day I moved into the farm, I adopted the dress worn by the women on the neighbouring farms—the blue and black striped woolen skirt, the little bodice of dark calico and a coloured handkerchief, and I parted my hair in the style fashionable today, piling it up and holding it in place with a comb. In summer, I wore cotton stockings and shoes. I only wore a gown or stays when I was going into town. . . . Many of our neighbours made a habit of passing through our yard on the way to Albany. As we knew them, we never objected. Besides, in talking to them, I always learned some fresh piece of news. As for them, they enjoyed talking of the old country. They also liked to admire our small improvements. What excited most admiration was an elegant small pigsty made out of wood by M. de Chambeau [a friend] and my husband. It was a masterpiece of carpentering, but the admiration was couched in such pompous terms that it always amused us: ‘Such a noble hog sty’. Because funds were tight, Henriette-Lucy made and sold butter, stamped with the family monogram; it “was much in demand.” She had eight cows and several slaves to assist on the farm. Then, she was dealt “the most cruel blow that any mortal could endure”: her daughter Séraphine was suddenly taken ill and died within a few hours. From Memoirs of Madame de La Tour du Pin, trans. by Felice Harcourt, (NY:The McCall Publishing Company, 1969), pp. 242, 253, 266, 282. See also In the Words of Women, pp.307-313. 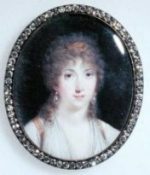 Illustration: watercolour on ivory (c.1802) in a private collection. ANN HEAD WARDER went back to England in July 1787 and returned to live permanently in the United States in October 1788. She describes the house she and her family were to occupy. 10 mo. 5th.—. . . . The house pleased me, being exceedingly convenient, though larger than I wished, it having four rooms on a floor—Kitchen, counting house and two parlors on the first floor, eight bedrooms and two garrets. Many handy closets. A small yard and beyond it another grass plot, good stable and chaise house, so that I see every prospect of our being comfortable. . . .
10 mo. 11th.—Went to market, at six o’clock to procure provisions towards housekeeping. . . . The difference in prices of things here and London is striking. . . . After breakfast purchased hand [?and] irons, to use for burning wood, all the chimneys being too low for stoves; some glass ware &c.
10 mo. 14th.—Arose early and sent off the balance of our things at mother’s, and after breakfast went to our house. We had for dinner a rump of beef, apple pie and vegetables. My husband seemed to think he had not for a long time eat a sweeter morsel, and I also felt comfortable, but not so much as hope to be when things are more settled. Only one bed up so the children had to sleep on the floor in the same room with us. 10th mo. 27th.—Today at dinner I entertained by fellow passengers. We had roast turkey, a tongue laid in mashed potatoes, whip’d sallybubs, oyster pie, boiled leg of pork, bread pudding and tarts. We had an early dish of tea for the old folks who left escorted by my husband. Ann Warder lived in Philadelphia until her death in 1829. She and her husband had ten children, seven of whom lived to adulthood. Thanks to her we have an idea of what life in Philadelphia was like in the years 1786-88. “Extracts from the Diary of Mrs. Ann Warder,” 62-63, The Pennsylvania Magazine of History and Biography, Vol. XVII, 1893, No. 1. British-born ANN HEAD WARDER was the wife of American John Warder, a merchant with a base in London and a branch in Philadelphia. 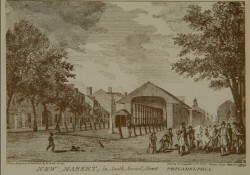 When family affairs required John’s presence he returned to Philadelphia in 1786 accompanied by Ann who kept a diary and wrote letters to her sister Elizabeth. (See an earlier post focusing on food and a Christmas feast.) The twenty-eight-year-old commented in a lively fashion on her experiences, gave her opinions on the city, its social life and customs, the climate, the food, and more. A Quaker, she noted that some practices of the Friends in Philadelphia differed from what she was used to. When the Warders first arrived they stayed at the home of John’s mother. 6 mo. 7th.—I rested well in mother’s best bed the room large and house spacious. Below are the shop and counting house in front; one large and one small parlor back, a delightful entry from the street to the yard. Up stairs is a good drawing room and three large chambers, with the same size cool passage. . . We dined at mother’s with only our own family, which fills a long table. I have mentioned those present except some of the younger branches. . . . they have fine hair and wear no caps, but handkerchiefs close up to their throats with a frill around the neck, in which dress much inconsistency appears to me. . . .
6 mo. 9th.—A crowded house began at 10 o’clock. Sometimes the recollection of you would make me ready to burst out with laughter, such new scenes are presented. Many in their own carriages have honored me with their company—Friends and others. Such a general use of fans my eyes never beheld, you scarcely see a woman without one, and in Winter I am told they visit with them as a plaything. . . .
6 mo. 12th.—Breakfasted at home comfortably, but it would be more so if the family were more attentive to the summons. . . . In the evening we took a nice walk, which gave me a clearer idea of the town, that it is in my opinion far superior to New York as Westminster to the city. The regularity of the streets and buildings with their entire plainness I much admire. . . .
6 mo.13th.—. . . . The family dined at Billy Morris’s. We had a very genteel dinner, indeed I think from my present observation that people here are more superb in their entertainments than with us. Provisions of every kind are cheaper, but the greatest luxury is the abundance of fruit. We have pineapples, strawberries, cherries, peas. . . .
6 mo. 14th.—In the afternoon, the weather being cool . . . in a phaeton . . . [we] took a ride of ten miles along the banks of the Schuylkill, with which I was much pleased. Several friends called iin during the evening, which I find is occasioned by the intense heat of the Summer—they walk most after dark and sit much on their porches, which as a mother I think expose girls too early to the acquaintance of men. 6 mo. 11th.—In this forenoon went to Market Street Meeting which I think is full double the size of Gracechurch street. It has five doors, one on each side of the minister’s gallery; near which I sit though much courted by beckoners to come under it. . . . At six went again to meeting, the day being so warm it was omitted in the afternoon. Returned home to supper when we met Brother and Sister Vaux with their only two children. The mode of dressing children here is not so becoming as with us, and I have scarcely seen a white frock since my arrival; their colored ones are very inferior to what we use, which with blue and yellow skirts and their necks entirely covered to preserve them, complete a dress very inconsistent with mothers’ appearance when from home, for not a woman has visited me but what was elegant enough for any bride. Indeed we could almost persuade ourselves that was the case from so much saluting—which is a practice here considerably out of use. A young girl esteems it an insult for a man to offer any such thing—the strictest delicacy subsists, beyond what I ever expected to find, particularly as they are more and much earlier exposed to men’s company. . . .
More of Ann Warder’s observations in the next post. “Extracts from the Diary of Mrs. Ann Warder” 444-448, The Pennsylvania Magazine of History and Biography, Vol. XVII, 1893, No. 1.